“You have very poor fashion sense!” the restaurant tout yelled at me angrily after I refused to sit down to eat. He had been aggressively pestering me and using his body to keep me from passing which meant there was no chance in hell I’d be dining there. And he was right about my outfit. In an effort to avoid the lewd, leering stares of Moroccan men I was wearing as many layers as I could, including long pants, a long bulky sweater, and a puffy coat zipped to my chin. I was sweating profusely underneath but preferred that to showing even a little skin. As a female traveling with another female on my first trip to Morocco I was not prepared just how much unwanted attention we would get. And on my second trip to Morocco, this time with my husband, the harassment improved but we unwittingly had our drone confiscated at the airport where it still sits to this day. 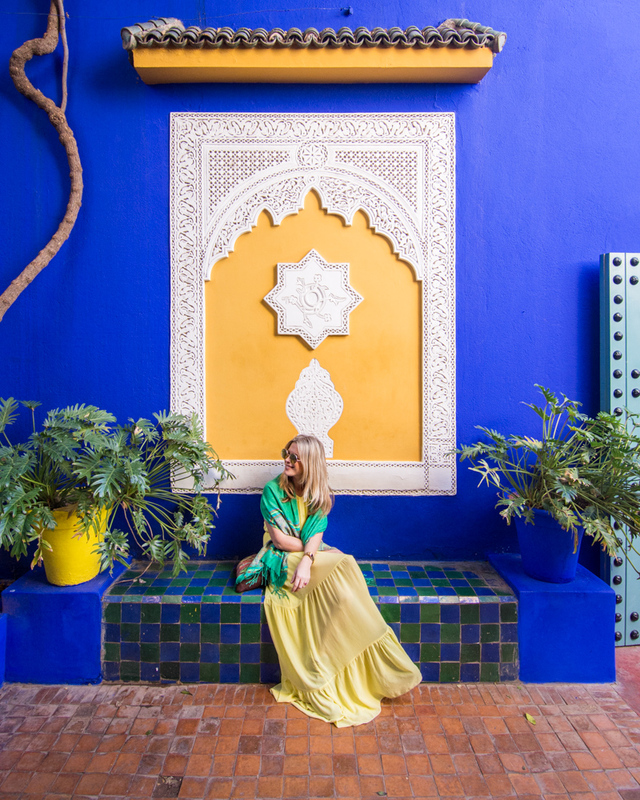 Both situations were upsetting and difficult to handle, and so I’ve written several posts to outline everything you need to know prior to visiting Morocco in the hopes of helping you to be more prepared than I was. Read on to learn about cultural norms, weather conditions, safety, and how to pack so you’re prepared for anything and everything! The official state religion of Morocco is Islam and 93% of the population is considered to be religious. The majority of those are Sunni Muslims. Meaning that most women cover their shoulders, knees, and often their hair. And some women wear burqas. 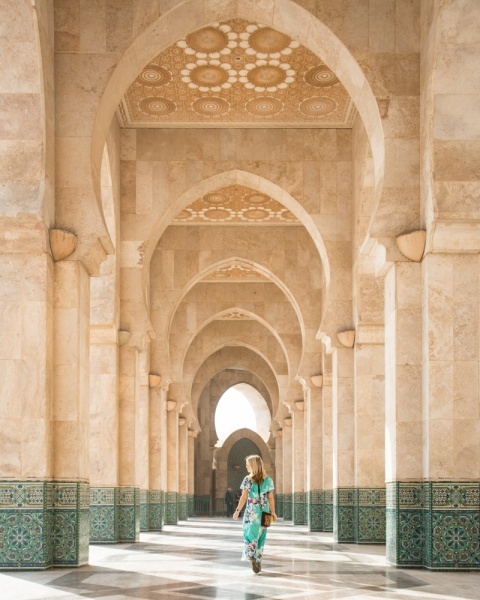 As a woman traveling in Morocco, you’ll probably feel more comfortable if you cover your shoulders and knees as well. Remember, you’re not here to change the culture, you’re here to experience a new one. TIP: Check the dates of Ramadan prior to planning your trip to Morocco. Ramadan takes place in the ninth month of the Islamic calendar. During that month Muslims fast from dawn until dusk so it is considered rude to be seen eating or drinking in public. Many restaurants and shops close during that time and others operate on a reduced schedule. In 2019 Ramadan will take place the first week in May to the first week in June. 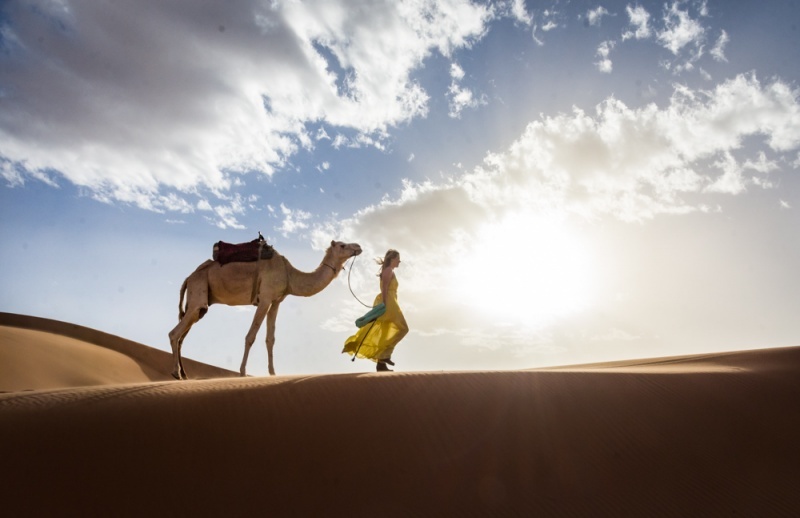 The climate of Morocco is very diverse and something you’ll definitely want to research before packing for your trip. If you were to draw a line from Northern Morocco to the US you would find that it is a similar latitude to Washington DC. And similar to that region, it also experiences very cold winters and even some snow. And since many riads and restaurants are open-air, you’ll want to make sure you can bundle up, even when indoors. The city of Marrakech has a hot, arid climate with temperatures ranging from 68 °F in December to around 100 °F in July and August. 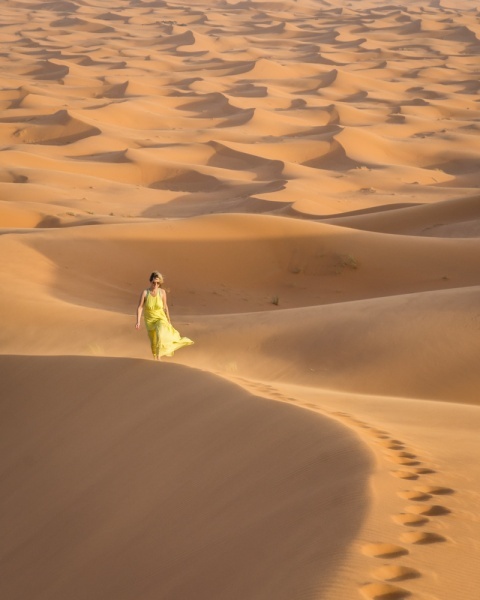 The Sahara desert is quite hot during the day but temperatures can drop drastically at night. And the Moroccan coast experiences strong trade winds and occasional rain showers. The best time to visit the country is in the spring or the fall when temperatures are not as extreme. Citizens of many countries including the United States, Canada, members of the European Union, Australia, and New Zealand will get a 3-month tourist visa-on-arrival. If you plan to stay longer you will need to apply for an extension visa with the Moroccan government. Be sure that your passport is valid for at least 6 months from the time you enter Morocco. TIP: While you can stay in Morocco for 90 days, your drone cannot. You’ll be required to leave it at the airport and pick it up again when you leave the country. After 45 days it becomes property of the customs office. There are a number of languages spoken in Morocco but the two official languages are Modern Standard Arabic and Amazigh (Berber). The second language for most Moroccans is French. And while most people speak at least a little English, they’ll appreciate if you learn a few common Arabic phrases. “Al Salam Alaikum” (pronouned sall-em wall-a-come) is a nice way to say “hello”. “Shukran” (pronounced shoo kran) is “thank you”. And “Ma’-Elsalama” (pronounced ma sell lem-a) is “goodbye”. If you plan to stay in one of the darling riads located in the heart of Jemaa el-Fnaa your taxi will not be able to get back into the tiny, winding alleyways. So you’ll probably be required to walk at least a portion of the way to your hotel. The alleyways are incredibly crowded and are often bumpy and uneven. So luggage that not only has wheels but is also lightweight so that you can carry it when necessary is the best choice. This set by Merax is highly durable, is made of nontoxic material, has multi-directional spinner wheels, a secure combination lock, and is lightweight. It also comes in bright colors so it’s easy to spot on the luggage belt at the airport. If you are like me and tend to overpack for vacation, these compression packing cubes by LeanTravel are perfect to allow you to get the most out of the space in your suitcase. Not only will they keep your things organized but you can also compress each cube down for extra space. The set includes 2 large cubes for bulkier clothing and 1 medium cube for underwear and socks. In Morocco you’ll be exploring many streets and alleyways that are dirty and dusty so having a barrier between your shoes and the rest of your clothes will definitely come in handy. This set of four by YAMIU is made of durable, waterproof nylon so they’ll hold up for countless future vacations. They’re also good to use to keep your dirty laundry separated. If you choose to check your luggage (which we would recommend due to TSA liquid restrictions), you’ll want a carry-on bag to have a few essentials on the plane with you. This bag by UTO is perfect as it can be worn as a purse or a backpack, plus it has a detachable cross body bag to wear while exploring the city. And it’s small enough to be considered as a “personal item” if you decide not to check your larger luggage bag. It’s nearly impossible to walk through the markets of Morocco without stopping to shop for treasures to take home with you. Quality leather goods, colorful carpets, and glimmering lamps are just a few of the things that you’ll find for bargain prices in Morocco. Unless you’re planning on packing lightly, you may have some trouble getting all of your new souvenirs home. Invest in this “just in case” duffel bag by Bago – it’s easy to fold it into a pouch and toss it in your suitcase, “just in case” you overdo it. Sleeping on airplanes is challenging for most people and if you don’t get at least some shut-eye on a long flight you’ll probably arrive to Morocco feeling tired and cranky. Invest in a compact travel pillow that’s lightweight and easy to throw in your carry-on. 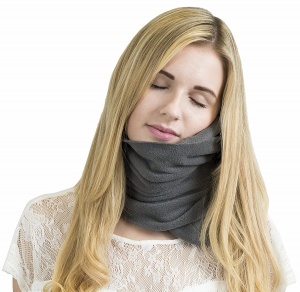 If you have a really long flight to Morocco and are concerned about your ability to sleep on the plane, invest in a natural sleep aid to help. Plus it’s nice to have to combat jet lag after you land. Download a few of our favorite podcasts to keep yourself entertained during takeoff and landing and while hanging out in the airport. Get a subscription to Amazon Audible for access to a huge selection of audiobooks in case in-flight movies aren’t available. 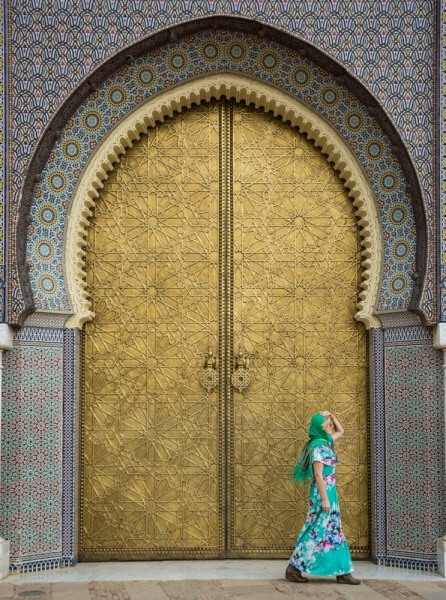 As you wander the streets of Marrakech, you’ll undoubtedly stop every few blocks to admire a colorful door or some stunning architecture. You’ll want a camera that will fit in your bag and that will capture higher quality photos than your cell phone. 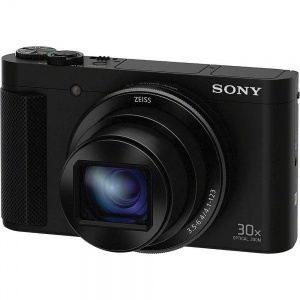 The Sony DSCHX90V has a 30x optical zoom range, a pop-up electronic viewfinder that’s great for taking photos in bright sunlight, and it has a built-in GPS receiver to record the location of your photos. Keep in mind that many Moroccans don’t want to have their photo taken so always ask prior to snapping. And don’t be surprised if they tell you “no”. In Morocco the electrical outlets are type C and E. The standard voltage is 220 V and the standard frequency is 50 Hz. 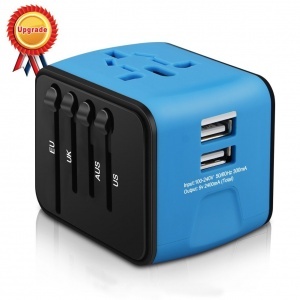 If you’re coming from the United States, you won’t be able to charge your electronics without a converter. Choose a universal adapter with multiple USB ports so you can use it in most countries and charge multiple gadgets at once. A common scheme around the winding alleyways of the Jemaa el-Fnaa is for Moroccan men to pretend like they want to help you find your way to wherever you are going. If you agree they will lead you there in a roundabout way or they won’t take you even remotely close to where you are attempting to go. And then demand a tip. Even if you don’t want their help, they’ll often follow you (this is very disconcerting if you are a solo female traveler). Do not rely on these men for help, ever. Download a Google Map of the area on your phone and use it to get around. Bring a power bank with you daily to ensure that your phone doesn’t run out of juice. 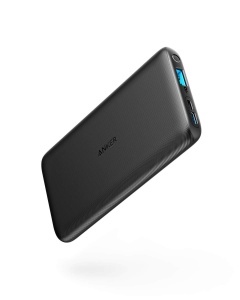 This one by Anker is super small and lightweight – it’s easy to toss it in your pocket before you head out the door. TIP: Don’t forget to download offline maps of the cities you’ll be visiting in Morocco. That way you don’t need wifi (or local guides) to find your way around. Bring a set of wireless earbuds to keep you entertained during your long airplane journey. 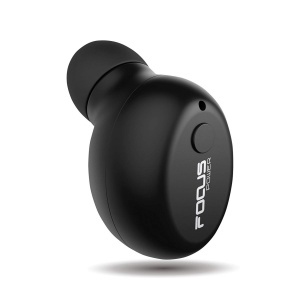 These earbuds by Focuspower are super small and comfortable, fast-charging, have a lengthy battery life, and can connect to two mobile devices at once! Plus they are quite a bit cheaper than the popular Apple earbuds. Keep all of your chargers, cables, earbuds, and everything else all in one place with a gear organizer. Keep it in your carry-on so you have easy access to everything you need while you’re on the plane, en route to Morocco. Keep all of your toiletries organized and easy to access in a bag that can either hang from a hook or sit on the counter. This one by Hikenture is waterproof and has plenty of deep, easily accessible compartments for all of your important beauty products. TIP: Make sure you schedule an appointment with your doctor prior to departing to ensure you are up-to-date on your vaccinations. Provide them with your travel itinerary so they can inform you of any additional required shots. These little 3-ounce refillable travel bottles are TSA-approved, BPA-free, and seriously so adorable. They are perfect for transferring your favorite shampoo and conditioner if you don’t plan on checking a bag. Even if you do check a bag, you can keep fill them up with face wash and lotion so you can freshen up mid-flight. Hopefully you won’t need it but it’s nice to have a travel first aid kit on hand, just in case. If you’re not used to traveling or if you have a sensitive stomach, it’s not a bad idea to throw some Imodium in your bag. Moroccan food tends to be pretty heavy and oily and can wreak havoc on your gut. Modesty is key in Morocco. Not only is it a Muslim-majority country, but as a woman you are very likely to be harassed and/or catcalled if you are showing even a little skin. But it can also be incredibly hot so you’ll want to bring clothes that are breathable and flowy so you don’t overheat. Depending on where you visit and the time of year, temperatures in Morocco can drop significantly at night. 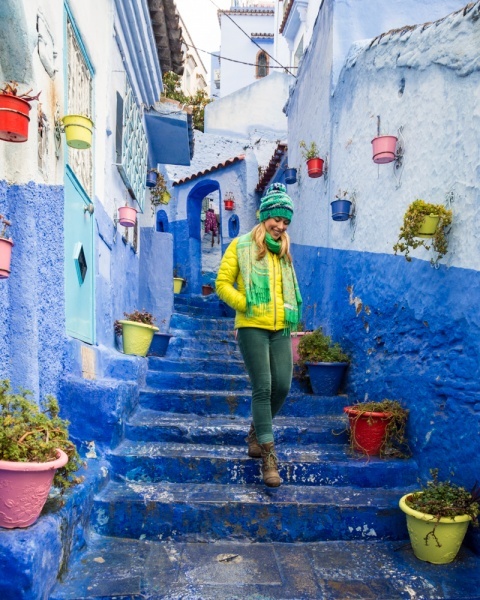 Cities at higher elevations, for example Chefchaouen, even get snow in the winter months. And if you plan on spending a night in the desert, nights can be quite cold. Bring a light sweater if you are traveling to Morocco in the summer and a much warmer jacket if visiting in the winter months. This one by Alexander + David is perfect to throw on over anything and it won’t be too bulky in your luggage. You’ll probably want to bring a variety of options for footwear in Morocco depending on what your plans are for the day and what the sidewalk conditions are. The winding alleyways of the markets are dusty and uneven so you’ll definitely want to wear comfortable, closed-toe flats. 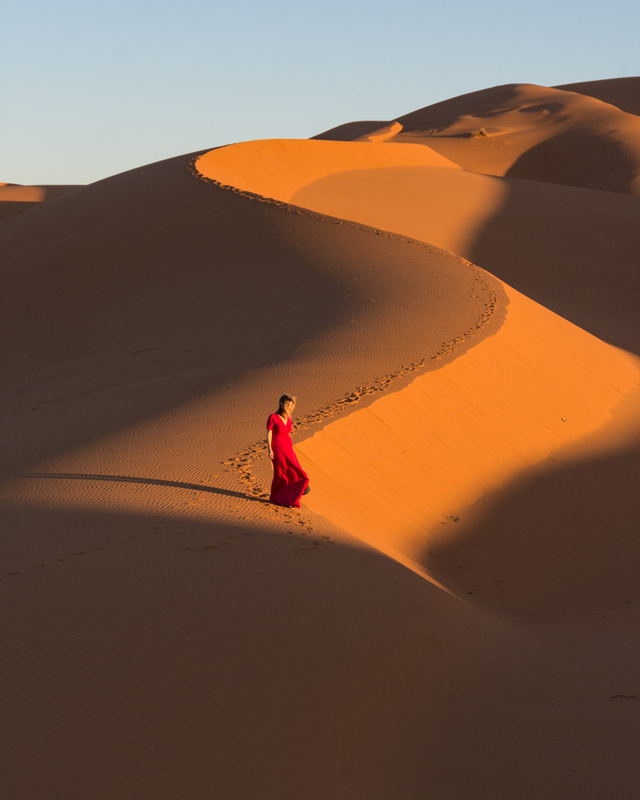 If you plan on hiking the vast sand dunes of the Sahara, you’ll probably want some tennis shoes. And if you’re hanging out in the laid back beach town of Essaouira, you’ll probably want some cute flip flops. Swimsuit and a cover-up if your hotel or riad has a pool. You’re unlikely to see any Moroccans in swimsuits on the beaches and you may get gawked at if you wear one. 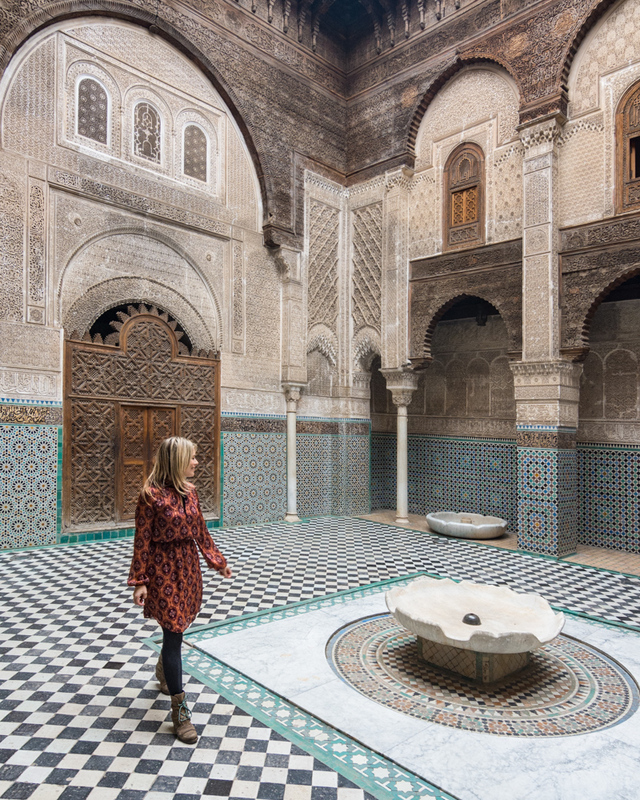 TIP: If you prefer to pack light and do laundry during your stay, most riads are willing to do it for you for a small tip. Foreigners aren’t expected to cover their head unless they are visiting a mosque. And interestingly enough, non-Muslims are not allowed to visit the majority of mosques in Morocco. The only one that we found that we could visit was the Hassan II Mosque in Casablanca and while you aren’t required to cover your head, you may want to do so out of respect anyway. Keep a scarf on you when you visit, just in case. Petty crime is fairly common in the larger cities and touristy areas of Morocco. You should be vigilant about keeping an eye on your belongings. Pack a crossbody bag with zippered pockets and keep your hand on it while walking through crowded areas. If you visit Morocco in the summer you can expect the mid-day sun to be intense. Lather up with sunscreen and wear a hat to keep your face protected from the dangerous rays. This straw hat by JOYEBUY is foldable so it will keep its shape even after being squished in your luggage. Of course you should also keep your eyes protected all day with a pair of polarized sunglasses. These even come with a sturdy case to keep them safe in your carry-on! To call your credit/debit card company and release them for use in Morocco. To check the international fees charged by your credit/debit card. 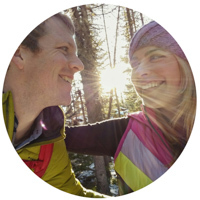 Consider signing up for our favorite travel card, the Chase Sapphire Preferred. It has no foreign transaction fees and loads of perks! Pack a backup credit and/or debit card in case you have any issues with your primary. Upgrade to an international cell plan during the month that you’ll be gone if you think you’ll need it. A ton of cash. There are plenty of ATMs in the airport and all over Morocco. Thanks for reading and we hope you enjoy your vacation in Morocco!